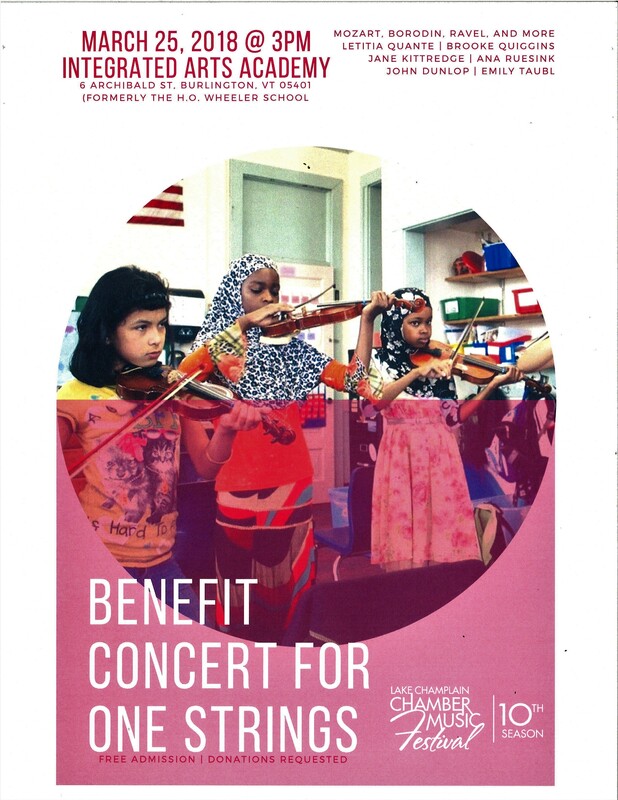 This benefit concert, on Sunday, March 25th, is for the ONE Strings program, which provides in-school strings instruction for all 3rd, 4th, and 5th graders at the Integrated Arts Academy (IAA) at the H.O. Wheeler School in Burlington’s Old North End. Music From Around the World highlights the diversity within IAA and the ability of music to bring communities together. The program features pieces by Borodin, Ravel, Mozart, Bartok, Joseph Bologne (the first classical composer of African ancestry), as well as some Danish folk music. Some of our ONE Strings students will perform under the leadership of Kathleen Kono, our ONE Strings teacher. Emily Taubl, cellist and LCCMF board member, has organized this family-friendly event, and local musicians are donating their talents for this wonderful cause. Come hear chamber works performed by Letitia Quante, Jane Kittredge, and Brooke Quiggins, violins, Ana Ruesink, viola, and John Dunlop and Emily Taubl, cellos. Proceeds from this benefit concert will allow us to evaluate and repair instruments donated by Mrs. Carolyn Long for student use. Admission is by donation. Give what you can to support this unique program in Burlington’s Old North End. Enter through the school cafeteria entrance by the Spring Street school parking lot.